Officially granted by Royal Warrant on August 25, 1906, by King Edward VII. A red Royal Lion on a gold background occupies the top third of the shield. Three golden sheaves of wheat on a green background, representing Saskatchewan's major agricultural contribution to Canada and the world, occupy the lower two-thirds. Officially granted by Royal Warrant on September 16, 1986, by the Right Honourable Jeanne Sauvé, Governor General of Canada, and by the Honourable F. W. Johnson, Lieutenant Governor of Saskatchewan, on behalf of Queen Elizabeth II. Atop the Shield is the Royal Helm, enwrapped and topped by a red and white mantle and wreath - red and white being the national colours of Canada. Resting on the wreath is a beaver, a national symbol of Canada, holding the official flower of Saskatchewan, a Western Red Lily, in its right paw. Resting on the back of the beaver is the Royal Crown, representing Saskatchewan's relationship with England. Supporting the Shield on the left is a golden Royal Lion. On the right is Saskatchewan's official animal: a White-Tailed Deer. Both animals wear collars of Prairie Indian beadwork. Suspended from the Lion's collar is a six-sided star with a red Maple Leaf, a national symbol of Canada. 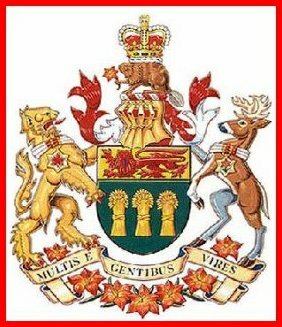 From the Deer's collar hangs a similar mullet (badge) with a Western Red Lily, the official floral symbol of Saskatchewan. The Motto, MULTIS E GENTIBUS VIRES, means 'From Many Peoples Strength'. The Motto is supported by an arc of Western Red Lilies. The Motto represents Saskatchewan's multicultural heritage, including Native contributions and the vital role immigration played in Saskatchewan's early history.